Both society and law enforcement have little patience for violent offenders. Our nation is one which believes that it must be “tough on crime.” This philosophy creates a situation where, when a violent crime occurs, law enforcement and prosecutors use every available resource to obtain a criminal conviction against the defendant. This approach, unfortunately, leads to instances where Defendants are overcharged or worse, wrongly accused. In both instances it is a criminal defense lawyer’s job to protect the accused and ensure that their Constitutional rights are defended. Bretton Barber is a Phoenix area attorney who aggressively defends Arizona residents against allegations of violent crime. Contact our office today to schedule an initial consultation. If the charge is a misdemeanor then the case will proceed in either Municipal Court or Justice Court, depending on where you were arrested. If the charge is a felony then the case will proceed in Superior Court. It will be crucial that you hire an attorney who is versed in Fourth and Fifth Amendment law, as well as trial procedure, to ensure that you are adequately protected. Bretton Barber takes an aggressive approach to defending the rights of the accused. Once retained in any matter involving a violent offense, Bretton will immediately begin building a defense. This includes filing to suppress any unlawfully obtained statements as well as other physical evidence. Any necessary investigators or experts will be retained and witnesses will be interviewed. We will ensure that the accused is prepared for trial and one knows what to expect from the process. We understand the serious nature of these charges and we treat them with a high level of priority. In addition to the Phoenix area, our lawyer services other Maricopa County cities such as Mesa, Glendale, Scottsdale, Chandler, and Gilbert. We also assist Pima County residents in Tucson. 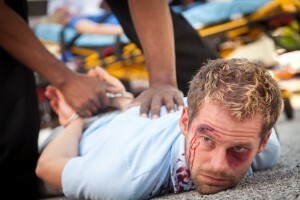 It is important that you be in contact with your attorney once you have been charged with a violence offense. Unfortunately, one of the most common complaints about attorneys is that they fail to communicate with their clients. Bretton founded the Barber Law Group upon the belief that the accused should be treated with a high level of respect. He promptly returns all phone calls and emails. He also provides clients with his personal cell phone number so he may be reached in the event of an emergency or if one has questions. We understand that Arizona residents need assistance in a time like this. Contact our Phoenix office today.